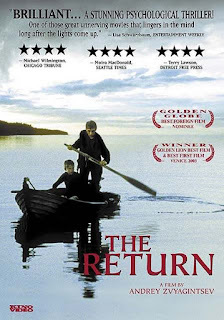 I loved Andrei Zvyagintsev's very first feature-length movie The Return, for its incredible cinematography as well as its moody intensity. Please see it! Our public library here in Portland has nine copies--all out, I'm pleased to note. In the movie, a man of few words and many secrets comes back to his seaside family after twelve years' absence. When his two sons come home from a rough game of double dare and tag, they see a strange car in front of their building, and their mother quiets them: their father is home and taking a nap. He emerges for dinner, however, and the air is thick with tension and mystery; obviously, this is not a chatty family. He says, "Well, hello." The boys greet him. The mother and grandmother look on at the scene, very present but very self-contained, keeping their counsel. He nods to the wine and says, "Pour it." The mother serves the wine to the boys, diluting it with water. Later, the mother lies in her bed, anticipating the entrance of her husband, her body and face turned toward the camera and away from the door through which he will enter. Her face, without any dramatics, reflects the complexity of this anticipation. Most of the rest of the film involves the adventures of the father and his two sons as he takes them on a car trip which becomes an incredible test of physical, emotional, and relational survival. But it was these opening scenes, almost the only scenes with female characters, that I'm thinking about now -- that is, now that I've also seen the documentary, The Return: A Film about the Film, that came with the DVD. 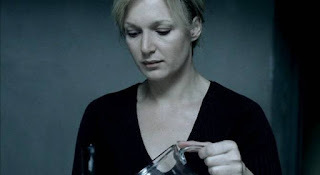 Referring to the mother as played by Natalia Vdovina, the director Andrei Zvyagintsev says, "My ideal woman? I don't know. I don't know. Maybe it's close to what was shown in the film. Because for me this woman embodied [femininity] ... for me, this is Woman with a capital W. A woman who knows how to be patient, to wait, and is wise. It is like in Russian fairy tales, where there is Vasilisa the Beautiful and Vasilisa the Wise." Mikhail Krichman, the cinematographer, adds, "I really like the scene in the house. I like very much how Natalia looks there. 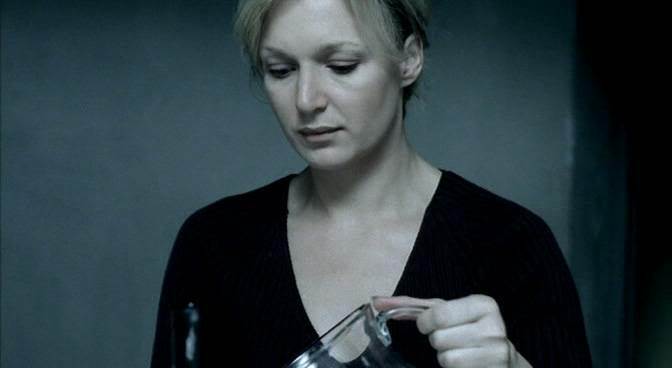 I like this shot, where she pours wine and dilutes it with water for the kids. How she obediently carries this out and doesn't say anything." I don't disagree at all with the extraordinary beauty of this scene and of the bedtime scene that follows. Her bearing reflects dignity and endurance ... and extraordinary acting. But I have no context from the story to evaluate whether her response to her husband's absence is from nobility, or strength, or fear, or pathological dependence, or perhaps it represents the calm before the storm. Perhaps the storm (or whatever form the accountability of husband to wife might have taken) happened while the boys were still away from the house. Many people, many women have endured hardships, absences, betrayals; and that endurance may often have been redemptive. How convenient it has been for some men to count on that endurance, that capacity to forgive; how many men who truly deserved to be kicked out on their cans, or deserved to find their place taken by someone else, or to find the gap filled by an unanticipated self-sufficiency, were in fact allowed back in. I am not preaching a simplistic anti-submission message. I'm actually trying to resist reading too much into the comments of those men in the documentary. But I'm also confessing a deep unease with the perhaps unintended reflection of that old cult of female endurance. Perhaps what my encounter with this dimension of the film proves is that, with all the years I've spent immersing myself in Russian culture, I'm an incorrigible American after all! On the other hand, the Russian women I have known -- even the Russian female stereotypes I have known -- are not entirely summed up in The Return's portrait of dignity, endurance, and obedience. The traditional stereotype is not complete without including the ability (not confined to Russian women) of getting to the goal despite the need to appear passive -- with some pragmatic combination of common sense, persistence, and deception. Nevertheless, is it too much to expect that the post-patriarchal (and post-cult-of-Vasilisa) reality might include honesty, companionship, and mutual submission? The other film I just saw, and want to plead with everyone to see, is Hotel Rwanda. I am still stunned by the ability of Terry George and his colleagues to make a film about genocide that is so profoundly low-key, given the story. The film is realistic in the sense that we see unimaginable terror taking place in scenes of everyday domesticity and urban life. Given the importance of Christianity in both Rwanda and Burundi, and the butchery that took place among supposed believers, I had wondered how Christian faith would fare in this mainstream movie. The most obviously Christian people (nuns in their habits, a pastor with collar) are doing their best to preserve the lives of the people in their care. The hero and his wife seem to be people of faith; the language of faith is a natural part of the way they talk. But (thank God!) there is no extra piety wedged into the script. The iciest absence of faith is in the radio transmissions of the "Hutu Power" militia as they constantly refer to the Tutsi people as "cockroaches." That objectification of other people, as Dale Aukerman and others have pointed out, is closely linked to the first sin after Eden, and the "thou fool" attitude condemned by Jesus. Even in the dreadful circumstances of Rwanda in 1994, the irrepressible dynamism of Africa is evident in the film as well. The lyricism of African English is both moving (as in conversations among the hotel staff) and shocking (radio voice, urging more massacres: "The graves are not yet full"). I cannot recommend this film highly enough. AP story on Yahoo News: "Jews protest Portman scene in Jerusalem" (where actress Natalie Portman and actor Aki Avni were kissing at the Wailing Wall). Big banner ad immediately over story: "Go ahead. Flirt shamelessly."